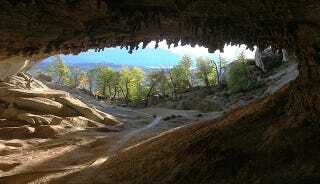 In 1962 a 23-year-old geologist lived alone in a cave for two months. He had no problem with it. In 1972, he tried it again, and nearly lost his mind. Naturally, there are people who choose to isolate themselves, but what would happen to someone whose primary goal in life wasn't enforced solitude? Michel Siffre, a 23-year-old French geologist, decided to try it out. He would go into a cave and stay alone for a period of time. At first he thought 15 days would do it; over time he decided that he needed to go bigger and planned a visit for two months, with little artificial light, no clock, and a telephone that only worked one way. He picked a cave in the Alps, which yielded the advantage of being geologically interesting, as well as below-freezing temperatures and 98% humidity. Constantly cold and damp, he only freaked out for one day — singing and dancing until he was tired out, otherwise he held up very well. When his team came to get him, he thought they were a month and a half early. His time sense was compressed — during his phone "conversations" with his team, he counted off his estimation of 120 seconds. It took him five minutes. He also called whenever he ate, slept, or woke up. Without natural light, he still fell into a 24-hour cycle — which turned out to be the most scientifically significant discovery of his time in the cave. The next time he went down into a cave, he didn't have as nice a stay. This cave was in Texas. Siffre was well-equipped and the cave was more pleasant in terms of temperature and atmosphere. Internal clocks had become a hot topic in science since his last stay in a cave, and Siffre wanted to tamper with his. He was trying to get on a 48-hour cycle. After two months he became horrifically depressed. His cycles eventually fluctuated between 18 and 52 hours. His lowest moment came when, after he'd spent days watching a mouse loot his food stores, he tried to catch it to have some kind of company, and accidentally killed it. During the experiment he had electrodes attached to his head, to monitor his progress. One day there was a lightning storm, and the electrodes gave him agonizing shocks. He was too disoriented by depression to realize how to make the pain stop until he'd been shocked three times. Despite the extreme depression, Siffre kept up doing isolation experiments in caves. He considered his six-month isolation experiment worsened by the fact that the atmosphere in the cave ruined the record player and magazines he used to keep his mind occupied. Granted, that probably didn't help, but how much music can anyone listen to? Would you like a little isolation? How long would you think would be perfect? How long before you couldn't stand it anymore?